Back pain is such a common problem that only a rare person has never experienced it. During any three-month period, approximately one-fourth of all U.S. adults experience at least one day of back pain – and many of these people experience much more back pain than that. Of all health problems, back pain is the third most common reason people visit a doctor or to miss work. Pain in the back can range from a dull and vague, constant ache that is more of a nuisance, to a sudden, sharp pain that stops you in your tracks and leaves you incapacitated. It can come on suddenly, as a result of an accident, a fall, or lifting something heavy; it can develop slowly and gradually, many times as the result of age-related deterioration anywhere in the spine. Regardless of how back pain starts, how intense, or where in the back it is located, you will know it when you have it. And chances are, because you are reading this article you want to know more about back pain because you have it right now. On the bright side, most people can follow certain measures to prevent, reduce or control most back pain episodes. Even if back pain prevention does not completely work, all is not lost. There are many simple home treatments, exercises, stretches and improved body mechanics that can be used to reduce the intensity and duration of your back pain and allow you to function at a higher level. Back surgery is rarely needed for a typical case of common and uncomplicated back pain. Although anyone can develop pain anywhere in the back because of overuse and trauma, there are a variety of back pain risk factors to keep in mind. Of these risk factors, some you can control or eliminate while others cannot be changed avoided. Some things you cannot change and you have to make the best if it. History – Your total past history of prior injury and the effects of prolonged repeated trauma are recorded in your tissue in the collection of arthritis, scars, worn down cartilage and shortened ligaments, broken bones that healed in an odd way and all the other signs of physical abuse you carry with you today. When we are young we abuse our body and do not realize we are making changes to the tissue that will someday result in permanent and painful tissue changes. We all do it, and we pay the price later. Get used to it and learn now how to reduce and control as much of these changes as you can. You will feel much better for it. 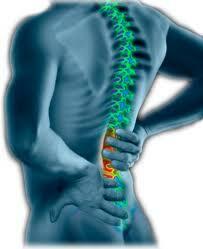 Age – You are not going to get any younger, and the aging process is a major part of back pain. Many people report their first episode of lower back pain occurred between 30-40years of age. This is associated with loss of tissue elasticity, reduced muscle tone, and greater inactivity that occurs as a person gets older. Heredity – Some families are prone to certain health problems, often for genetic reasons. Often a deep fundamental cause of back pain is a genetic flaw that allows one or more spinal bones to be malformed or misshapen, resulting in abnormal movement or structural weakness of one or more areas of the back that in turn allows back pain to develop. A high percent of structural spinal problems have a congenitally malformed bone or ligament that places a demand on the surrounding healthy tissue to compensate for this hereditary problem while it attempts to support the spine and allow movement. Eventually the normal tissue breaks down due to the compensation and additional stress and it becomes part of a larger back pain problem. Another cause back pain that can affect the entire spine is ankylosing spondylitis, a form of severe arthritis that affects the spine by causing vertebra to fuse together, has a genetic component. Race – Race can occasionally be a factor in certain cases of back pain. For example, African American women are two to three times more likely than white women to develop a condition known as spondylolisthesis. In this condition a part of a lower lumbar vertebra near the nerve root separates into two pieces causing great pain and structural weakness. Presence of another disease – Many diseases can cause, complicate or contribute to back pain. Various forms of arthritis (osteoarthritis, rheumatoid arthritis), Paget’s disease, cancers of different organs that eventually spread to the spine, as well as kidney, prostate, uterus, and bladder diseases that create a reflex pain in the spine can all cause back pain. Fitness level – Back pain is very common among people who are not physically fit, allowing their structural support muscles, tendons and ligaments to be weak. Poor tone of back and abdominal muscles allows the spine to become physically stressed in many different ways, eventually leading to back pain and later spinal arthritis. Additionally, those people who compensate for their lack of physical activity during the workweek often physically overexert themselves on the weekends – the weekend warrior. This infrequent and overly concentrated effort to get into good physical condition is not ideal, and often causes painful back injuries. It is best to avoid this intense approach in favor of frequent moderate physical activity and low impact conditioning exercise that does not stress the muscles and joints of the spine and avoids back pain. Low-impact aerobic exercise has been shown to be good for the spinal disks that cushion the vertebrae, while high-impact aerobic exercise (jogging on concrete) is harmful to the spinal discs. Diet: High fat and high calorie food intake, or highly processed foods, that make up a major part of a diet, when coupled with an inactive lifestyle, lead to obesity. Excess body weight alters normal body mechanics and places additional impact on spinal joints as well as those of the lower extremities, ultimately leading to back pain. Occupation: It is not very easy for a person to change their line of work or their career because of their back pain; it can be done, but it usually is not easy to do and is not usually practical. Far better to learn if it is possible to stay employed in your current occupation, but to change whatever you think is aggravating your back while you are doing your work. It might be that your immediate work conditions need to be changed to reduce low back stress, as well as how you use your body. The idea is to change whatever is changeable based on the information you find on this website. Your chances are very good that you can stay in your current job and have less back pain if you follow these recommendations. An occupation that involves little physical activity contributes to poor physical conditioning and weakness of the skeletal muscles. When coupled with poor posture and use of a poor fitting chair or a stressful work-station, can lead to back pain. Conversely, an occupation that demands repeated or rapid heavy lifting, pushing, or pulling movements, especially when accompanied by a deep forward bent posture, twisting or vibrating the spine, will eventually lead to injury, spinal arthritis and back pain. Cigarette smoking: Although smoking does not directly cause back pain, it has a strong contribution to many structural problems because nicotine destroys vitamin C in the body. A lack of vitamin C prevents normal formation of collagen and fibrin in all the tissues of the body, eventually leading to weakness of all joints and soft tissues – hence greater tendency for back pain.